There are a few ahem...things which I would Like It Longer. I would like to have longer legs. Simply because I would look so good wearing skinny jeans with high heels. And I would also like to wear those super long Sommerset Bay dresses that reaches my ankles. Only people with long legs can get away with it. 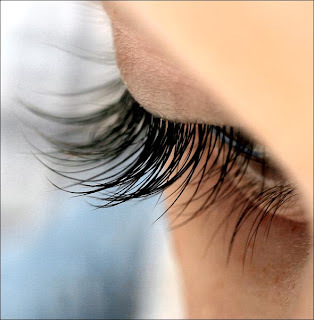 I would like to have longer eyelashes. So that when I bat my eyelashes at people, they will actually notice it. Ok. So I don't own a 10 carat diamond ring. 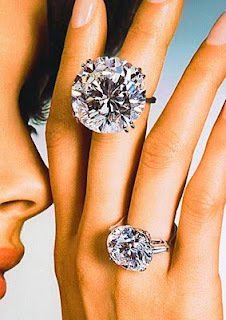 But I do own a half-carat diamond ring and it will only look good if I have long fingers. Unfortunately, my fingers and short and pudgy. But I guess people must and have to be contented with what we have. Contented with God's gift to us even though I have short legs, almost-invisible eyelashes and short, pudgy fingers. But to see it in another perspective, having these short body parts make me the unique person I am now. 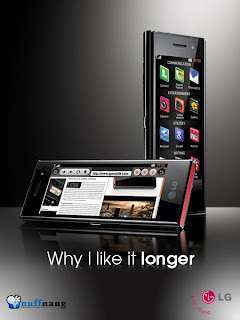 But one thing that I would like to own and is not God's gift is the LG’s new Chocolate phone (BL40). It has a unique long shape that allows for a 4-inch widescreen and is a sleep supermodel phone. Ohh...how I wish I own it. At least I would have one long thing I could finally called my OWN! Give you some other "naughty" perspective to write the post. I mean the handphone battery life. giapseng...nice to see u here. ive heard peter talked about u but i have not met u officially yet. anyway, haha...are u sure u meant handphone battery life? hehe.